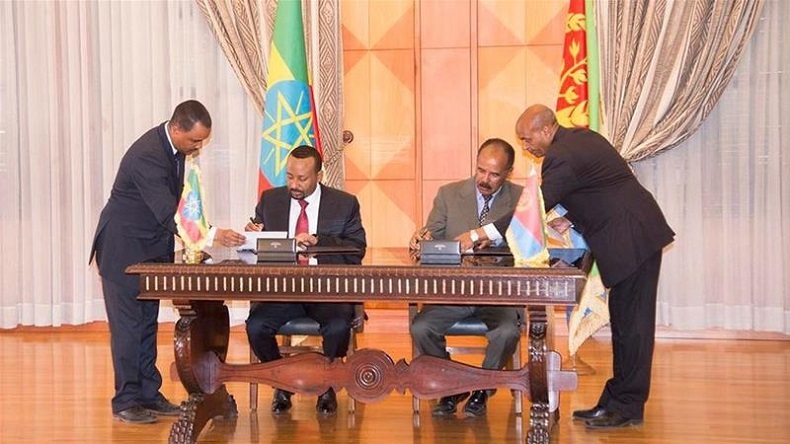 Friends turned into foes, Ethiopia and Eritrea on Monday, July 9, signed a landmark agreement to end the perennial war between the 2 countries. The declaration was signed during a historic summit between the leaders of the countries in Eritrea's capital, Asmara. In a major breakthrough, Ethiopia and Eritrea declared their ‘state of war’ over on Monday, July 9, ending the 1998-1999 border conflict. In a landmark agreement, summit between Eritrea’s President Isaias Afewerki and Ethiopia’s Prime Minister Abiy Ahmed marked the 1st meet in Eritrea’s capital, Asmara between the 2 neighbouring countries after almost 2 decades. The state of war that existed between the two countries has come to an end and both the countries will work together to promote close cooperation in political, economic, social, cultural and security areas, Eritrean Information Minister Yemane Gebremeskel wrote on Twitter. The conciliatory meeting comes a month Abiy accepted a peace deal which ended a two-year border war between the 2 countries. Pictures of the ceremony showed that both the leaders shared a wooden desk, backed by their nation’s flag, as they while signed the historic document. Eritrea and Ethiopia, considered as world’s poorest countries, spent hundreds of millions of dollars on the massive war and witnessed thousands of casualties as an overt consequence of the strife.